We left Cimmaron, NM Friday morning, January 22 heading for San Cristóbal de las Casas in the southern Mexican state of Chiapas. Our intent was to spend a nice relaxed winter in the warm climate of that mountain city. 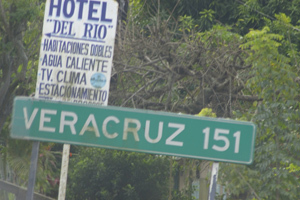 As often plans do, ours changed as the days passed and we have, it seems embarked upon a grand tour of southern Mexico. So far, so very good! 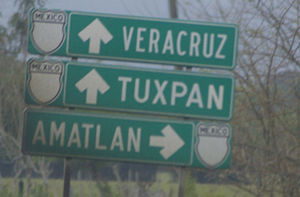 This page will take you from Cimmaron to Veracruz. The morning of the 22nd we say goodbye to the resident turkeys on the Vermejo. And later in the day we say goodbye to the last threats of snow in NM getting close to Texas. Sooner or later you'll be able to click here to see all the traveling companions. Here's Kathy! 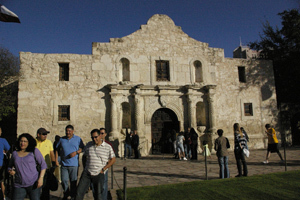 Where else but The Alamo in San Antonio for a good lesson in the history of international relations between the USA and Mexico? 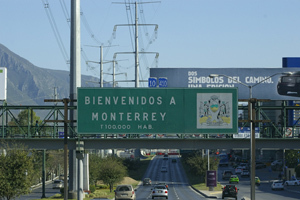 Pasa por Monterrey - We just passed through the big city with modern high-rises and freeways and elevated commuter trains. 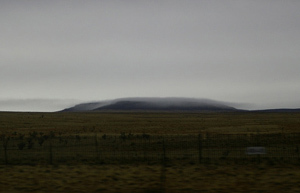 It sits in a valley between some awesome mountains but doesn't seem particularly inviting. Much more so was the town of Linares so the south past Ciudad Victoria. 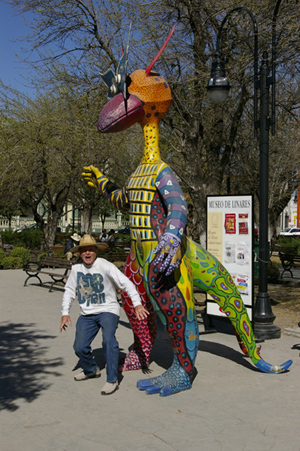 Clean and appearing prosperous, it was safe to park the car at night in Linares and the public art was FAR OUT! 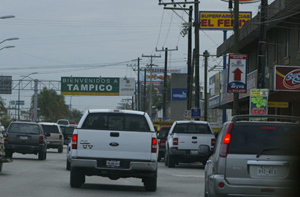 Tampico as another pass-through. We were tempted to stop at McDonalds. Just kidding but they're all there - McD, BK, KFC. You name it. We drove on and on keeping an eye out for the hotel we'd stayed in the last trip this way thinking we'd passed it long ago when we happened upon it at just the right time of day. 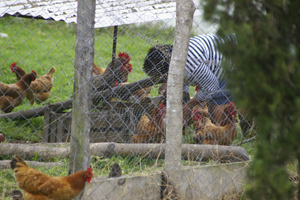 The next morning the chickens clucked whie this lady collected the eggs. 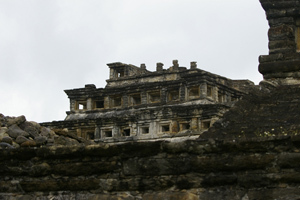 A really impressive and unexpected site - the ruins at Tajin. I'd never heard of them but really glad we turned in to see. Vamos a ver was the right move that day. 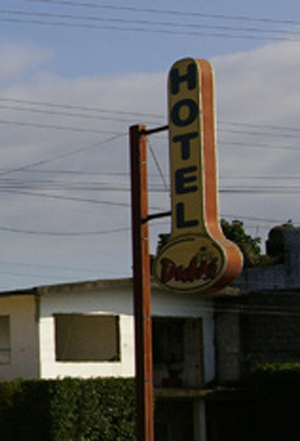 The hotel Dubai in San Rafael. What more is there to say? Well, quite a lot, but that's one of those stories for later. Finally! The beach and the Gulf. 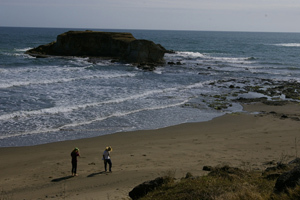 It's not exactly a beach trip, but it was nice to catch a little dance in the sand - then up to these ruins at Quiahuixtlan. 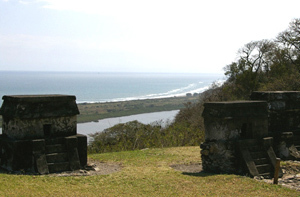 These dollhouse-sized stone structures appeared to be miniatures of full-sized ones at [Bonampak?] (I have to check on that). 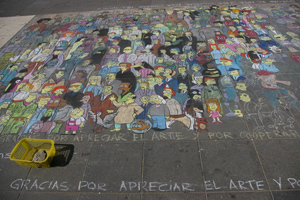 On the sidewalk on the waterfront in Veracruz it appeared maybe an open invitation to add to the project. No one around. but a supply of chalk at hand.